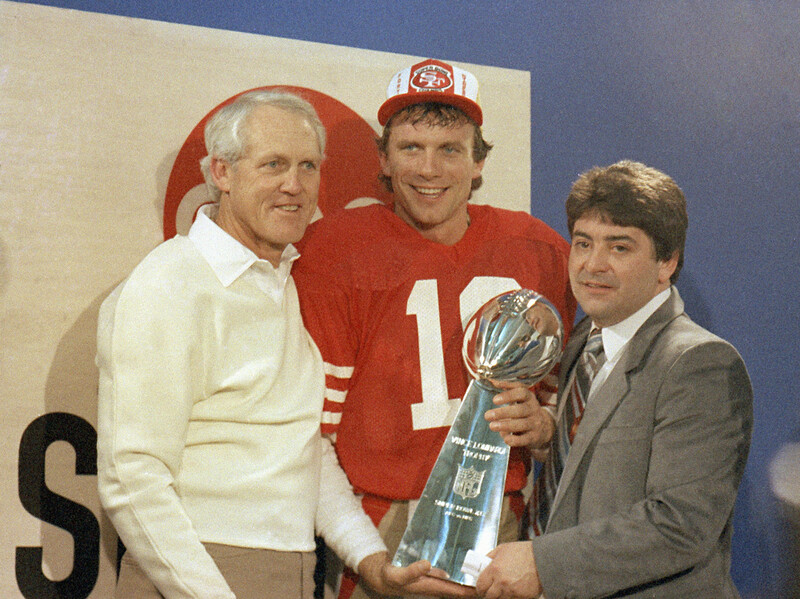 In the 80s in the NFL the San Francisco 49ers owned the decade. They amassed seven Division Titles and four Super Bowl wins. I can’t even think who would be a distant second–The Redskins boasted 3 Super Bowl appearances and two wins in the big game and in 1988 had a quarterback later called out by Flavor Flav in “She Watch Channel Zero? !.” The Dolphins had the awesome Dan Marino, but they could never really get over that hump. They had two Super Bowl losses, the latter of which no doubt still enrages their handsome former field general from the second his eyes snap open every morning. The Denver Broncos made it to the Super Bowl three times (almost always at the expense of the last even remotely competent Cleveland Browns team) and each time left the field with a silver platter of their own posteriors clutched in their taped-up hands. It’s no contest. The San Francisco 49ers were the franchise of the decade. They had a visionary head coach, a preternaturally clutch quarterback, and the supreme wide receiver of the day. Not to mention a stellar supporting cast all over the field on both sides of the ball. That secondary! That O-line! That Hall Of Famer backup QB! But all this success stemmed from one 5′ 5″ goomba named Eddie DeBartolo, Jr. He had fathomless pockets and a Walter Mitty-esque relationship with his players. He couldn’t BE one of them, but he could be close to them, and that made all the difference. Eddie was a new breed. If the old guard like Wellington Mara and Art Rooney, Sr. were known for their cigars and scotch, here was nose candy and $150 shots of brandy flung down the gullet like so much chilled Jagermeister. Bum-rushing Super Bowl cities all decade with a raucous posse of northeastern Ohio mooks in tow, Eddie was a diminutive man with a big personality. A real force of nature. Shots for everyone! Rolexes for everyone! Private planes for everyone! The 80s were heady times, as Jordan Belfort and Michael Milken could tell ya, and Eddie, Jr. was right there on the track, straining towards the finish line shoulder to shoulder with those hedonistic thoroughbreds. Of course, jail beckoned for all of them. Actually, Eddie skated with a seven-figure fine after dumping a Winn Dixie shopping bag stuffed with 400 grand in the lap of the governor of Louisiana, but the NFL stripped him of his beloved team and football in the Bay Area hasn’t been near those dizzying 80s heights since. The “revival” of the last five years has coincided with the appointment of Eddie’s tenderfoot nephew as team CEO. If you don’t think that kid has his uncle on speed dial, you’re nuts.